The Royal Swim takes your dolphin swimming experience to a whole different level, an interactive swim filled with both action and speed. Get up close and personal with the Caribbean’s most playful and friendly dolphins and discover all the amazing skills these marine animals have. You’ll experience the famous foot push ride, where two dolphins will push you from the soles of your feet up through the water surface. 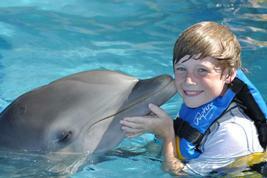 Afterwards, you will hold on to the dorsal fins of the dolphins as they take you on a speed ride through the water. 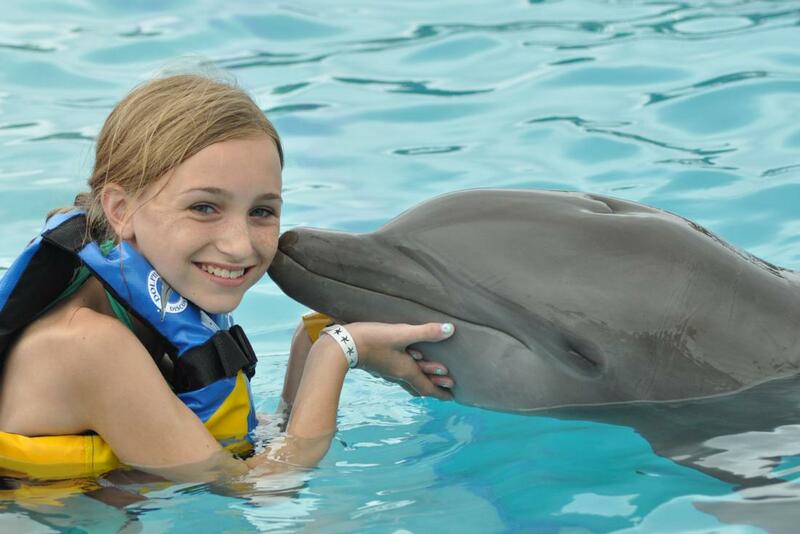 You’ll also enjoy a wet hug, a warm handshake and even a special kiss from these bottlenose beauties. Next you’ll make your way, to the Grand Cayman turtle farm, one of the world’s few Turtle Conservation Parks. Here you’ll have the chance to take a look at the breeding pond, which is home to the green sea turtles and also the turtle touch tanks, where you can reach in and touch the yearling turtles for the perfect photo opportunity. Smile for ‘Smiley” the 9 foot saltwater crocodile as he puts on a show! Keep the memory of this special day alive when you get local crafts from the Splash Gift Shop. Enjoy the the famous foot push ride. Speed ride through the water, as you hold on to the fins of the dolphin.